What do you think of when you say "happy birthday?" Cake!!! What is a birthday with that fluffy dessert? Cake is everywhere. It is disguised as muffins, bagels and bite-sized cupcakes. If humans can enjoy these fancy treats, why can't our pups? That was part of our thought process when we created our Mini Pupcakes. 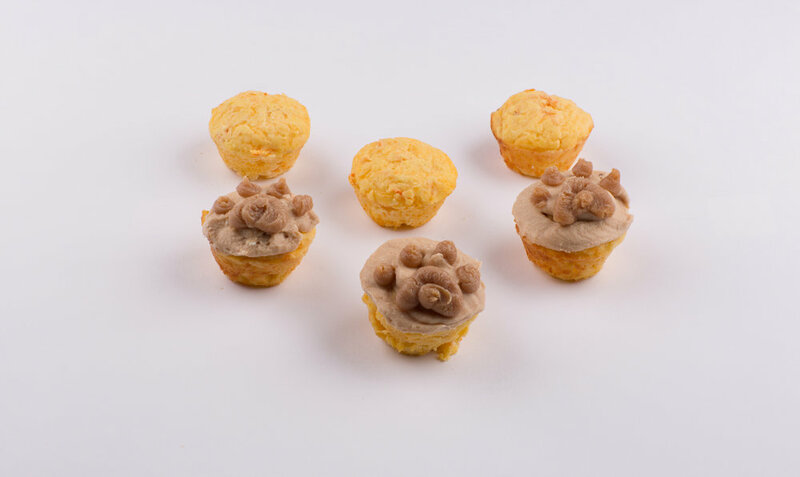 Since dogs do not need sugar or salt in their diet, we wanted to make these soft treats just as tasty (for dogs) and as fancy as one of our own human cupcakes. Keeping the ingredient list short and healthy, we found a recipe that looks and tastes fabulous for our furry friends. These gluten-free treats are made up of rice flour, chicken broth (or water by request), local carrots, cheddar cheese, local eggs, unsweetened applesauce and baking power for fluffiness. Kora gives her stamp of approval to the carrot and cheddar recipe. We look forward to creating additional flavors to share with your pups in the future too.